Zapruder explores what poems are, and how we can read them, so that we can, as Whitman wrote, “possess the origin of all poems,” without the aid of any teacher or expert. Most important, he asks how reading poetry can help us to lead our lives with greater meaning and purpose. Anchored in poetic analysis and steered through Zapruder’s personal experience of coming to the form, Why Poetry is engaging and conversational, even as it makes a passionate argument for the necessity of poetry in an age when information is constantly being mistaken for knowledge. 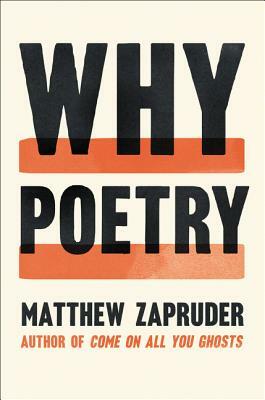 While he provides a simple reading method for approaching poems and illuminates concepts like associative movement, metaphor, and negative capability, Zapruder explicitly confronts the obstacles that readers face when they encounter poetry to show us that poetry can be read, and enjoyed, by anyone. MATTHEW ZAPRUDER is the author of four collections of poetry. His poetry, essays, and translations have appeared in publications including The New Yorker, The Paris Review, Tin House, and The Believer. An associate professor in the Saint Mary’s College of California MFA program and English department, he is also editor at large at Wave Books and, from 2016 to 2017, was the editor of the poetry page of the New York Times Magazine. He lives in Oakland, California, with his wife and son.